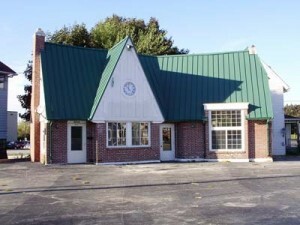 Bartles-Maguire Gas Station | Waukesha Preservation Alliance, Inc. The Bartles-Maguire gas station at 422 E. Broadway in Waukesha is a “house” style gas station and is eligible for the National Register of Historic Places. The “house” style gas stations were built in the 1920’s and were designed to blend into residential neighborhoods. The nomination papers for the National Register list three other “house” style gas stations in Waukesha County. Two of these have been demolished and the third has an inappropriate addition on it. Therefore, this is believed to be the last intact “house” style gas station in Waukesha County. Jim Draeger at the State Historical Society did a documentary on old gas stations. It can be viewed at http://www.wisconsinstories.org/fillerup/. The building at 422 E. Broadway was built in 1929 and was known as Wally’s Service Station from the 1940’s until 1967. Then, it was a fruit stand until 1997. The most recent tenants were used car dealers. The 1939 service bay was designed to match the 1929 “house” portion of the structure. Because there were two identical gas stations built by the Bartles-Maguire company in Waukesha, this is believed to be their signature style station in this area. The other one is demolished and no other buildings of this signature style are known to exist. It was designated a local landmark by the City of Waukesha in July 2010.